She is in a private practice since 1990, Have done over 10,000 surgeries including laparoscopies and hysteroscopic. She has attended national & international conferences. 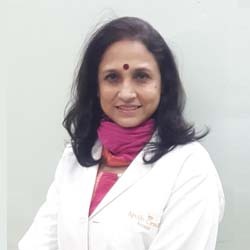 She has extensive experience in handling high risk obstetric cases, and routinely caters to laparoscopic and hysteroscopic surgeries and IVF. She is also an empanelled doctor for the Embassy of Germany, UAE, and specializes in Nutrition & Wellness. I was placed under the supervision of Dr Loveleena Nadir in the Apollo Cradle. She was amazing and made me feel at ease. The entire team of Apollo Cradle were on their toes and provided a world-class experience to us. We had an amazing experience. Considering the good experience I had at Apollo Cradle, I would surely recommend it to everyone in the future. I was admitted to the Apollo Cradle under the observation of Dr Loveleena. She made my entire stay very comfortable and easy. The nursing staff is exceptionally good and so is the housekeeping staff. We can’t thank the Apollo Cradle team enough for providing us with an amazing experience. I will definitely recommend it to my friends and family members.